Combat sports as a fitness activity is exploding, with boxing, kickboxing and MMA-style workouts en vogue among those hoping to learn new skills and break free from monotonous gym sessions. While the overall fitness benefits are well documented, there has been little way to quantify whether skill levels are improving without actually stepping into the ring. For most folks - ourselves included - being punched or kicked in the face isn't high on the list of workout priorities. Enter Hykso. 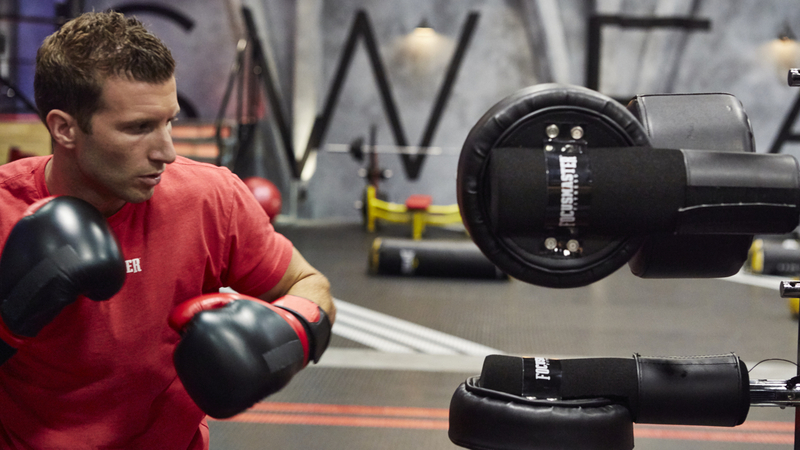 Its $190 wrist-worn sensors track the number of punches thrown during a workout, as well as average punch speed. Combining those metrics provides an encompassing Intensity score. The last we time we chatted to Hykso, it was prepping Team USA boxers for the rings of Rio. Now the company is diversifying beyond elite fight gyms to the consumer fitness arena with the new real-time Hysko Gym Experience. Thanks to the waterproof sensor, which ships to pre-order consumers with a new charging case this autumn, the same metrics harnessed by the pros can be beamed live to large displays at partner gyms. This enables participants in the Gym Experience to track performance and gains in the number of punches (and their average speed), while also competing against fellow participants or working in a group setting to reach pre-set goals. "The one thing that's keeping combat sports fitness from reaching the next level - that cross fit level – is the inability to quantify progress," says Tommy Duquette, Hykso co-founder. "People look better and feel better, but there's no way for them to gauge if they're really getting better at the discipline. That's when it gets stale." "Remember, these are fight sports. Boxers and mixed martial artists get into the ring and compete with other people. That's how they measure improvement. But most people don't want to get into the ring and get hit and who can blame them?" Hykso is one of many companies using wearable sensors to push data to individual and group tiles on in-studio displays. This can act as a means of quantifying effort and performance while fostering competition and goal-based camaraderie between members. As with many of these solutions there's also a companion app that breaks down performance and measures it against previous workouts. However, whereas the likes of Orangetheory and MyZone reward effort through heart rate tracking, Hysko believes performance output is a far more effective metric. "It's really compelling what live performance data can do in a class, but for me it's a stretch to based it on heart rate," says Duquette, a former USA boxing standout. "In those situations you can get more points even if someone is outworking you. You can chug a Monster energy drink before a cardio class and score more points. It's odd to me. "We see the ultimate value in being able to quantify physical output in class through performance. I think that's the best way to motivate people." Following a recent trial period, the Hykso Gym Experience will begin rolling out to partner studios this winter. The company has just signed an agreement with the CKO Kickboxing gym franchise, to bring the workout to 70+ locations across the United States in 2017. "We are so excited to be working with the CKO team," says Hykso's Tommy Duquette. "They are the most forward thinking of all the kickboxing fitness franchises." The solution is also being pitched to independent gyms. Kyle Coletti, who has two kickboxing studios in Albany, New York, is one of those early adopters. Coletti created the acclaimed Focusmaster workout, featured on the Sweat Inc. TV show in the United States (think of it as Dragon's Den for fitness regimes). His class is centered around the proprietary G-1000 machine, which features highly durable strike pads placed at customizable heights and angles. Focusmaster Markets from Focusmaster Fitness on Vimeo. The forthcoming Hykso integration will enable Coletti to add an element of competition and gamification to his custom workout. "It's so industry specific," he tells Wareable. "I've been trying to integrate punch counters into my machines to add a little gamification, but this is ten times better. It does so much more. "If people come in on a Monday and hit 700 punches at an average speed of 14 miles per hour, it creates a base level, a target for them to go after all week. "We want the latest and greatest and this is one more piece of the puzzle to improve the experience for our members. "When someone asks 'What makes you different from the boot camp down the road?' we can say we can track your punches, your speed and your intensity. It's so much more specific." Hykso says it has over 100 gyms on a wait list for the technology, which will be sold through partner clubs and directly to consumers. We're hoping to attempt the Hykso Gym Experience in the coming months and will report back with our findings - thankfully minus any black eyes.